Fourteen years ago, I traveled to Kenya in East Africa with a handful of my dear college friends lending our hands to local businesses and families. What has remained constant with me from that journey is that the human spirit is the same wherever you go. Whether you are young, like I was at the time, twenty two years old, or whether you come from abundance or from little, we all desire camaraderie, kindness, and warmth, both physically and emotionally. I learned a lot that summer about how I wanted my life to be. I realized for the first time that my world really is rich and full of resource. I finally learned that with hard work, anything is possible. Hard work was the constant lesson from which my parents fashioned the threads of who I am and that is the thread that carried me 8000 miles from home and was the same thread that was apparent in lives of the Kenyan families I met, lived with, and loved. We all hope and dream. And so, you ask yourself, I love fabric. What does this have to do with me and my obsessions? 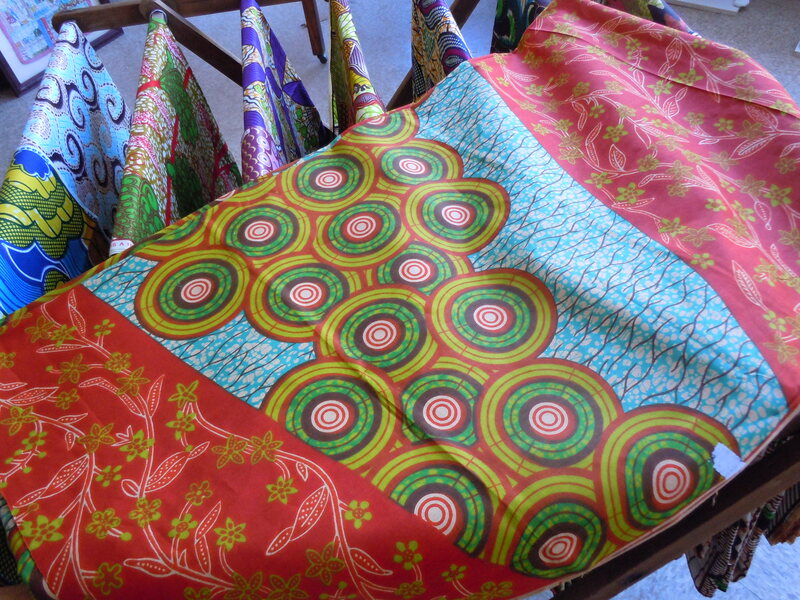 New at Crimson Tate :: Modern Quilter are West African textiles that will make you very happy. Wax block printed, rich, and full of color, these fabrics are available by the yard and are waiting to be sewn into your own histories of life, love, work, and everything in between. That story will benefit a few of the neediest and dearest miles away. Here’s the good stuff: 10% of the sales of these fabrics will benefit a local Indianapolis non-for-profit called JabuAfrica. Sarah Castor and her husband Dave have adopted three boys from three different orphanages in three different countries of Africa. 10% of the funds raised from the purchase of these African textiles will go to JabuAfrica which will distribute monies to support those organizations. She is my dear friend from college, one of the dear friends that went with Kenya that summer of 1996 that changed our lives, and since she has started JabuAfrica. The mission is to lend financial and emotional support to grassroots organizations caring for orphans in the countries of her children’s birth. It makes me cry each time I think of it. I love that my friends, quilters and sewists of Indianapolis, can support Sarah in her mission to make the lives of her boys’ families and communities better. Pingback: JabuAfrica • What do ya got?